On this page I will tell the story of the now infamous Boscombe Down Crash that occurred in 1994. An article about the crash, researched by Ren Hoek and Marco Van der Valk, appeared in Air Forces Monthly, and in this review I will go over Ren and Marco's and my own (plus other's) research. What happened at RAF Boscombe Down? The Ministry of Defense - as always - refused to comment on it, and to this day (since 1994) we only have testimony from witnesses who saw the incident - and the aircraft involved. Unfortunately, no pictures were taken of the incident, so we do not actually know exactly what the aircraft looked like, but we can get the general idea from the witness reports. Featured in this report are several other aircraft that do not normally transit the UK, which suddenly appeared at Boscombe Down after the 'incident'. RAF Boscombe Down is situated in the county of Wiltshire, not far from Stonehenge, and the huge Salisbury Plain Training Area. Boscombe Down is the prime Airfield/Facility of the United Kingdom's Defense Evaluation and Research Agency (DERA), now named QinetiQ (Kinetic) because most of it has been privatised. Its Official name is 'The Air Force Flight Test Center' which , as you might have noticed, is the same name given to Edwards AFB. This is because Boscombe Down is the UK's answer to Edwards. DERA/QinetiQ tests and evaluates Aircraft, Weapons, Operating Procedures, and other equipment such as avionics and software/systems before they actually go into service on any vehicle/aircraft in the British armed forces. 'The Down' is also home to the prestigious Empire Test Pilots School who test and fly the new aircraft, avionics and everything that enters or nearly enters the UK's flying inventory together with the School of Aviation Medicine, which co-incidently has a Hawk T1 jet named 'ASTRA'. Many projects go on here that the public does not know about, many are secret. DERA/QinetiQ conduct various trials on many different kinds of aircraft, and also trials in the USA on ranges such as China Lake (used frequently by Boscombe units), and also operating from bases like Edwards AFB but these are infrequent. The agency has a 'permanent' facility/complex at China Lake NAWC for year round testing on the range, spending several months of the year located here with various aircraft on live weapons trials etc. The base is not very easy to see, operations wise, in most places due to its elevation above the road which is why it is good for secret operations but the approach affords great photographic opportunities of every aircraft in and out of the base. Programmes such as the Eurofighter Typhoon are developed at BAe SYSTEMS home base of Warton, however the avionics and features (the classified parts) are tested at Boscombe Down on other aircraft before they enter service into the Typhoon. The Royal International Air Tattoo (the official World's largest and most spectacular Military airshow), usually held at RAF Fairford, has also been held at The Down - when Fairford was 'busy' with Bomber commitments (B52 and B1B), or being renovated. But during a show much of the base is shut to the public, and many areas are sealed off. Indeed, Air Tattoo volunteers have even been arrested (by RAF Police) during the Airshow - for taking the tail-numbers (& photos) of the aircraft! But i doubt the base will be used in the future for this again due to it being impractical to base operations. The incident report is full of unexplained answers, and you will see the word 'apparently' appear often, because we have no evidence apart from what witnesses 'thought' they saw and the fact that, the MoD won't comment on it...which makes it suspicious even more. On September 26th 1994, something happened at RAF Boscombe Down - apparently involving the United States most secret and number -one Black Project aircraft. During that night, the Aircraft involved made its take-off run down the long runway. Just before rotation, the aircraft experienced some serious problems which led to the crew immediately letting-off the power and shutting down the engines. Initial reports suggested that all it was, was a DERA Tornado GR1 having a mishap with a Target Towing Banner and landed with it still deployed. However, why won't the MoD comment on what happened if it was only a target towing accident? Also, Tornado GR1's do not do target towing. A Witness remembers seeing the aircraft at the end of runway 23, surrounded by the base fire vehicles and other emergency vehicles. What the witness noticed, was the aircraft was half-covered in tarpaulins. Also spotted, and this was maybe the cause of the crash, the rear of the aircraft was in actual fact much, much higher than the front of the aircraft - indicating the nose wheel had collapsed or broke off. Now, we don't know that this was the actual cause of the crash, because the witness did not state if the aircraft was actually on - or off - the end of the runway. If it was off, then the nose wheel could have collapsed while skidding over the grass. If it was on, then this may have been why the crew immediately aborted take off - who knows? Whatever happened, the aircraft was sitting there - surrounded by emergency vehicles - with tight security, and an apparent nose wheel collapse! What was also noticeable, was that the tarpaulins were actually over a frame, which in turn covered the aircraft - this may have been not to give way part of the aircraft's lines and shape...until later that is. The witness described seeing the rear section completely in view, with the tarpaulins only covering the nose and center sections. Quite clearly apparent, was that the aircraft had Inward - Canted - Tail-planes - reminiscent of the F-19 'scribbles' we have seen in the past. So why was the Tarpaulins only over the center and front sections?, immediate reports of other witnesses and apparently a leaked paper suggested that the TWO crew were actually KILLED in the accident, and if that is true, then obviously there was more to it than a nose wheel collapse. If the accident was indeed that serious, why didn't the crew of the aircraft eject to safety, or atleast try to? And could the MoD & DoD cover up such a story if the crash was indeed fatal? From what Ren and Marco found out, the next day an Army Air Corps Agusta A109 appeared at Boscombe, after transiting from Bournemouth's Hurn airport. Interestingly, located near Hurn, at Poole in Dorset is the HQ for the Special Boat Sqn (SBS). Some of you may have not heard of these, but they are the maritime equivalent of the SAS (Special Air Service), and like their counterparts, are regarded as the world's most 'elite' force. The SBS however are very secretive in their operations, much more so than their equivalent, the Navy SEALS and it is extremely rare you ever hear of any operation involving the SBS. The Army Agusta A109 aircraft are only operated by the SAS at Hereford. So, did the MoD (and DoD) draft-in either the SAS or SBS - to maximize security around the airfield? The Army A109's are based at Credenhill, SAS Headquarters in Hereford but are seen in various locations, even using civil airfields for refuels and make frequent stops at the nearby Army Helicopter Training School at AAC Middle Wallop near by Boscombe Down. A question is also asked, as to why the A109 was at Hurn, and was it really there to pick up SBS troopers, in my opinion I doubt it as the HQ in Poole has it's own Heli-pad. Also, according to Marco and Ren's research, a RAF Special Forces Chinook from 7 Sqn (Special Forces Flight) was flown in direct from nearby RAF Odiham, to assist in the 'security' during the night of the crash. During the following day - the 27th - not much was seen on the base by witnesses, and the security operation in effect wouldn't have allowed that anyway, until they had shifted the aircraft into a hangar. DERA was retiring an old RAF - come DERA - Buccaneer, serial XV344, which was used for testing advanced avionics and weapon systems and appropriately named 'Nightbird'. During the roll out from the hangar on Boscombe Downs North side, witnesses were faced with a remarkable site within the hangar. In the front left hand side, the aircraft that had the incident was sitting there - and within view was not just the rear section, but the forward fuselage as well. The center section was covered in tarpaulins. They described the color of the aircraft as 'charcoal grey', and not black as was expected. Also, as well as the inwardly canted fins came another prominent feature, the Cockpit Canopy was in fact hinged at the front, and not at the back - like most 'normal' aircraft. Also described were 'Chines' extending from the front to the back of the aircraft, similar to the SR-71 and YF-23. What Marco and Ren found out about this particular C-5 is linked with the whole 'Black Project' issue. The C-5 was apparently inbound to Ramstein AFB in Germany, not uncommon for a C-5 as this happens every day. But this C-5 was monitored by airband enthusiasts like myself, saying that their trip to Ramstein was now changed, and that they wanted to divert to RAF Boscombe Down. 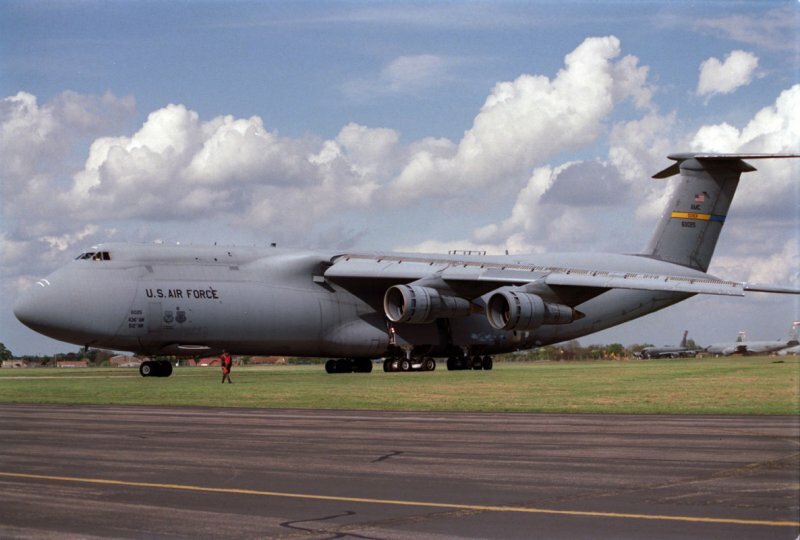 Well, the only time you usually get to see a C-5 at Boscombe is when some sort of airshow or USAF deployment is being held (which is so rare) - so you can see, it was a pretty weird thing for a C-5 to be landing at Boscombe 'out of the blue'. Also, if it needed to 'divert' from it's original flight plan to Ramstein, then it would have some sort of problem and so would divert to the near by 'Military Emergency Divert' airfields of RAF Brize Norton and Lyneham or the most obvious choice, RAF Mildenhall or Fairford, the latter of which is not that far away. Anyway, what was even better, and linked it more to 'the project', was that its departure flight plan was from RAF Boscombe Down to 'KPMD'. KPMD is an ICAO code designator for the airfield at Palmdale, commonly known as 'Plant 42', which incorporates the Lockheed 'Skunkworks', and the Northrop Black Projects Division. Plant 42, coincidentally, operates two modified C-5 Galaxies, serials 68-0213 & 68-0216. These aircraft were apparently modified in 1990-1992, and used as 'Space Program Outsized Load Carriers'. But like Ren and Marco describe, why were they modified in the 1990's when the space program had the same massive loads tens of years before this? Above is the Exact 68-0216 aircraft. Its sister is the 68-0213. 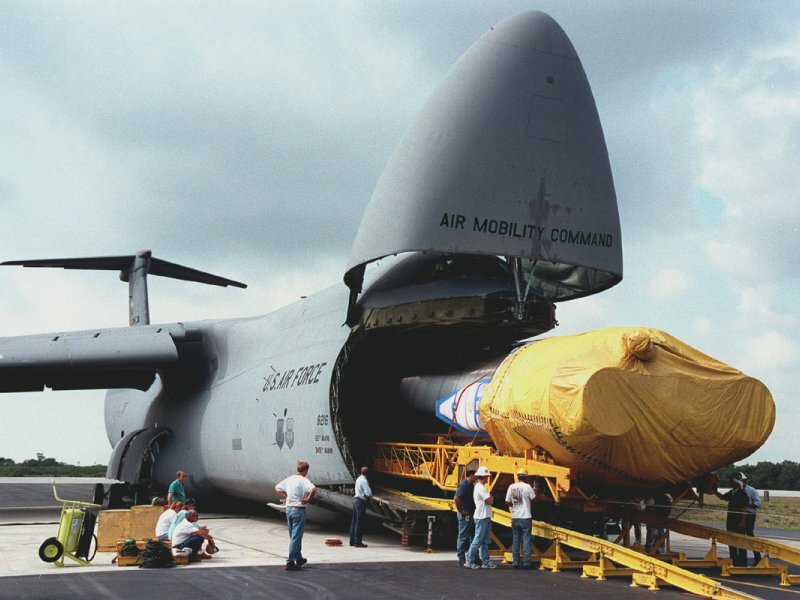 'One' of the C-5C '68 twins' having a booster loaded into the cargo bay. 68-0126 has some history.... Find out more on the Janet Background page. The same witness who spotted the C-5 also saw a US C-12 depart from Boscombe Down, following the departure of the C-5 that night. Now, C-12's are very common in the UK, transiting to and from Ramstein, RAF Mildenhall , RAF St Mawgan (and Fairford), but extremely uncommon at Boscombe. Also visible, apparently, was an unmarked Boeing B707. On the same night as the C-12 and B707 were seen, another unmarked aircraft appeared at 'the Down' - this time even more significant! It was a Boeing 737 of US Government property, commonly known as a T-43. What is striking, is that these T-43's had the famous EG&G markings and are used as "Janet" flights - to ferry workers to and from Area 51, Tonopah and Palmdale / Edwards. So, what was this aircraft here for? Was it really here? According to Witnesses it was. Don't forget, the MoD and DoD deny anything happened at this RAF Base, yet what's all this US Activity doing here? Photo: Copyright© Andre' M. Dall'au. 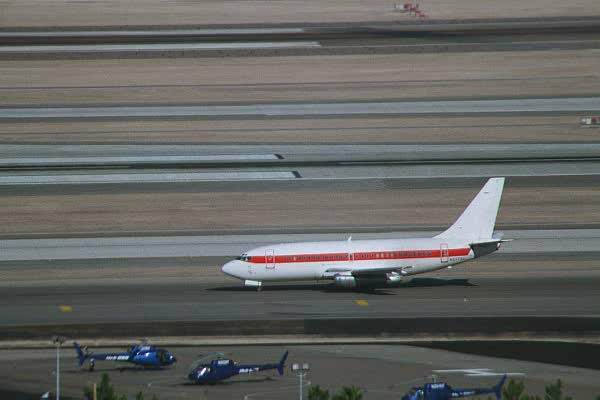 EG&G Boeing 737-200 taxi-ing at McCarren airport, Las Vegas. Some T-43s are leased to EG&G Special Projects company based in Nevada, who are the general contractor for operations in Area 51 and Plant 42, in fact EG&G even have their own site at Plant 42. According to Ren and Marco's AFM report, an 'unidentified' aircraft was monitored on the 29th September - using the callsign "N1178X" - and was on London-Military Radar (South), frequency 133.300 (VHF) control. The aircraft was heard to be climbing, and turned towards my area (Devon), and then when over Exmoor National Park, turned north - on UA25 air route (which goes directly above my town) to, wait for it, RAF Machrihanish. But don't get too excited, Machrihanish is used alot by civil and military traffic when they are routing across the north Atlantic...it's VOR identifier is MAC and so this aircraft was probably using the VOR like many other aircraft do each day for it's journey home to the United States. What the report found out, is that 'N1178X' was the serial number of a US-based Piper-made light aircraft. So why was a 'Janet' flight using a serial number of a private US aircraft as its callsign? Why did the Janet plane come all the way over here, utilising several airports on the way for fuel. Why not transfer the personnel via a C-21 or C-20? Well, this was also found... Some of the Janet aircraft had allocations such as N5175U, N5176Y and N5177C and so on, but note that these link up with N1178X in the fact of the middle numbers of 175,176,178, etc. So, is this all a stir up for secrecy? Using bogus callsigns and serial numbers is a way to do this, it has been done before many times but i still do not know why they chose to cover up a B737 (apart from it's normal use in Nevada). The above is a different aircraft to the N604M but shows you the general configuration of the Gulfstream. On October 5th, N604M was seen to make a 1hr stop at London's Heathrow Airport, and on the 7th it was seen at Southampton Airport - what was it doing in Southampton? Further to my research I have found that Northrop Grumman has it's UK Head Quarters in Southampton. A tie up? So, Officials on board this particular 'C-20' may not have been just CIA (from which the aircraft was reported to be operated), the aircraft was indeed carrying Northrop Grumman Officials to and from Southampton's Facility. This is a very crucial link into N604M's track in the UK and of course to the whole Northrop link. So can we safely say that indeed this incident was Northrop's and Definately NOT Lockheed Skunkworks? . What also 'may' be apparent, is that officials MAY have taken a visit to the University of Southampton, maybe for re-possessing the records of the vibration and sound 'footprint' the aircraft made while on approach to Boscombe Down as to not let out the details to the public (See below). On the night of September 22nd, The University of Southampton and RAF Lyneham (a major RAF C-130 Hercules base) reported an unidentified aircraft flying into RAF Boscombe Down's MATZ/LARS Area. Now, the same night - at the same time, witnesses around Boscombe Down reported "a very strange noise" approaching the airfield, reported as sounding like a 'slow freight train', that was 'rumbling' - and possibly making frequent 'humming' noises.It was weird enough for the local TV news to report it the next morning. 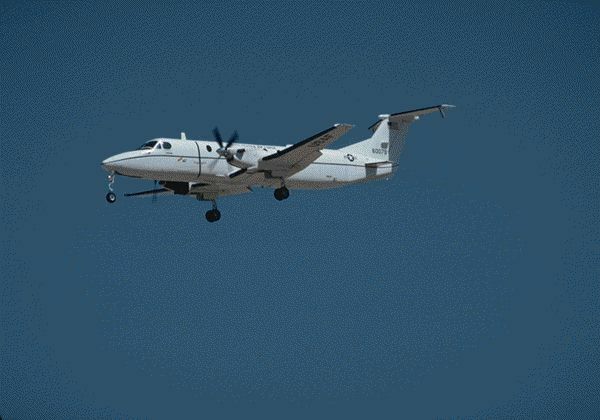 The University of Southampton reported this because they are 'world renowned' in the study of sound and vibration - which weird sounds they monitored from this unidentified aircraft. Could the CIA or Northrop have possibly visited the University of Southampton when the C-20 Gulfstream landed there? Did they go there to 'claim' the recordings of the 'black project's' engine and vibration sounds? As for N604M, on October 9th it departed 'The Down' for Luton Airport, north of London. Apparently this VIP jet has made several visits to Luton, perhaps not surprising, considering its close proximity to RAF and USAF monitoring and intelligence bases such as RAF Chicksands and Bampton Castle. However, to dampen the spirits, looking through movement records of the aircraft, it has made appearences all over the UK and very frequently. At my local airport, it has made several visits since the incident, and also many visits to other airports including Luton and Heathrow again in apparent VIP (not necessarily Military or affiliated) transits. What is apparent though is that MI6 (British Intelligence) uses Chicksands, and so does the CIA - its American counterpart. RAF Chicksands was renowned for being a large Cold War Intelligence facility with the famous 'elephant cage' antenna array system. It then departed Luton, direct to Farmingdale in New York. This is a good link, considering Farmingdale is the home of Northrop's Electronic and Systems Integration Division. 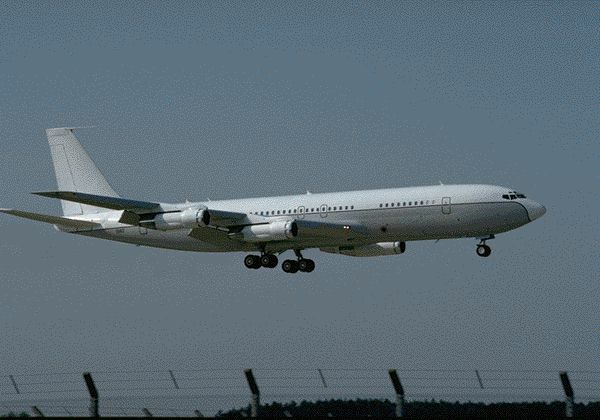 Over a year later, November 12th 1995, the G-4 (C-20) was back, this time from Heathrow. It had made a short flight to my local airport of Exeter, Devon. What was odd, was the extreme amount of security around the aircraft while on the ground just like when it appeared at Luton. To add more on other aircraft seen, what is of note is that, a month after the incident at Boscombe Down, a US Government EC-137 (serial 67-19417) apparently appeared at Exeter airport. So, was this the mysterious, unmarked 707 that appeared at Boscombe the night after the crash? What is worthy of note, is that - according to some sources - an EC-137 was seen at Machrihanish several times, over several years, when 'black things' have been apparently going on at the base. But why the extreme tight security around a C-20? Was it the nature of the persons on board or was it something else? So what was going on at my local airport? Why was the EC-137 there? And why was the Gulfstream surrounded by extreme Security? We don't know - unfortunately! Now - the EC-137 is of course operated by the United States Air Force, but this particular EC-137 was the only variant to have the same construction number as its serial number, making it officially a US Government aircraft - and not an Air Force plane. Also of note, is that all government agencies can use this aircraft, and the fact that the CIA can use it may be a link to the Gulfstream at Exeter. 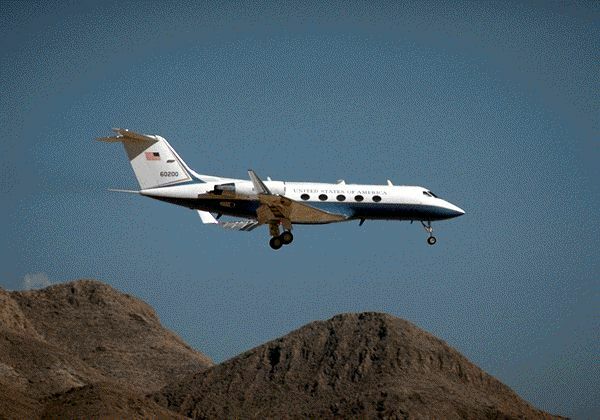 The aircraft was also used alot by Special Operations COMmand (SOCOM). But, we now go back to the official cover-up story of 'an accident involving a towed target'. A few years ago, it was reported by a witness elsewhere that he had seen a Tornado F3 towing what looked like a flare which was making a very strange humming/buzzing sound. This was actually a towed missile decoy, which was developed at Boscombe Down for use on the Tornado to deter missiles. The excuse made up by the MoD of the decoy now seems viable, considering the noise heard but was it there that night and not a target banner. Just before the crash at 'The Down', several fisherman - a few hundred miles south west off Devon and Cornwall - reported an extremely high-flying aircraft, leaving a 'sound of humming', (yes, like that heard at Boscombe). Also, they mentioned that several sonic booms were heard in a matter of minutes, suggesting this aircraft made a supersonic dash of several times faster than sound, in a few minutes. Much of the area off the south west coast of England is used for gunnery trials, live-firing exercises, and a lot of aircraft practice Sonic transitions there, it was also a flight-path of Concorde of British Airways and Air France when it was in service. Now, over Holland in 1992, and in 1994 before the crash, people reported severe cases of sonic booms over their country, and actually reported it to the Government. From what it looked like, the booms were monitored by stations in Holland to go right through the middle of the country, and it appears (and this may not be true), that the trail of noise led to Austria and the Alpine Regions. WAS THE BOSCOMBE INCIDENT THE 'ASTRA' PROJECT? In this section, we go over the part of Ren and Marco's report which discusses the 'Astra' project, as well as some other 'stuff'. According to Ren and Marco, the Incident aircraft at RAF Boscombe Down was, in actual fact, designated 'AIR VEHICLE - 6 ' its constructors number is 90-2414. However searching for this serial to any related program has been very hard. What this has to do with ASTRA, Farmingdale Airport, and the YF-23, is very important. Nice colors aren't they? apparently the cockpit area of the YF-23 is near enough identical to what the witnesses saw except the rest of the aircraft was not. Although this is the size of the aircraft the witness estimated, shame we have no photographs. The YF-23 is still considered more advanced than the F-22 and is being tested in different guises for advanced aircraft programmes. Back in the early 90's - you may remember - Lockheed actually stated, during a conference, that they "...had nothing to do with a hypersonic spy plane called AURORA." In actual fact, it may become quite clear as to why they said this. According to research , AURORA may not have been a Lockheed 'Skunkworks' Product - but, in actual fact, a Northrop development! Another factor is that the 'Aurora' has supposedly been replaced by the 'ASTRA'. Other reports suggest that Aurora was the code word for the B-2 Spirit when in development at Area 51. ASTRA stands for Advanced Stealth Technology Reconnaissance Aircraft, and ASTRA was apparently Air Vehicle 6 - AV-6. Northrop is definitely the developer seeing as it is called an 'Air Vehicle' Air Vehicles are designations given to all Northrop aircraft being developed. The B-2A Spirits were Air Vehicles ranging from AV-1 - AV-21 (21 aircraft). So....AV-6 obviously was the 6th aircraft in the ASTRA Series/variants, or was it? One thing we have to make clear here is the confusion of ASTRA with the Hawk T1 based at Boscombe Down, also named 'ASTRA'. ASTRA was believed to be operating with radio frequencies between 500 and 510MHz. As stated in the article, not many Radio scanners can actually tune into that range of Frequencies. Some proper mil-airband radios are able to scan the full range - I am, in fact, able to receive those ranges on my scanners. But in my own opinion, i really doubt any aircraft, classified or not will use a different range of frequencies, they will instead rely on good encrypted radios, who knows, even their secure radios might be 'advanced' and classified and not in service on any other aircraft. The reason stated earlier, (that most scanners cannot receive this 500mhz range), would help the ASTRA - & other projects - to go testing 'unnoticed' by the Scanner-Heads, Interceptors and Monitors. Perfect way to get around isn't it, but then...so is advanced secure radios. So, according to the reports, AV-6 (ASTRA #6) was operating into Boscombe Down with the call-sign "Black-Buck 11". It had been operating with a 'chase' plane. Now, I'm not sure on that call-sign - this may be viable to the AV-6, but it may be misleading - by the fact that I, and thousands more have heard Boscombe Down based Tornado's use the call-sign of "Blackbox". This being their primary callsign for Test flight formations out of Boscombe almost daily. Could whoever heard the call-sign "Black-buck" have misheard it for "Blackbox"? Who knows...as with a little interference on the radios, many variations of a callsign can be heard by different people at other locations. The ASTRA is (supposedly) directly related to the YF-23 ATF Program however. To date, from what I have seen, the YF-23 is more advanced - in technology - than its winning counterpart, the F-22 'Raptor'. In the report, it states that the ASTRA is the SR-71's hypersonic replacement aircraft - which until now has been thought of as the 'Aurora'. But according to Lockheed, Aurora was the codename for Northrop Grumman's B-2 Spirit when under development at Area 51. So, can we assume that the Aurora has now gone, and the ASTRA is its replacement. Could the ASTRA be the real project name of the hypersonic aircraft? Was 'Aurora' put in there as a bluff? or was the AURORA the B-2a Spirit like Lockheed had told the world? Or, does AURORA actually stand for an aircraft programme, like ASTRA does. "Advanced Ultra _ _ Reconnaissance Aircraft? The papers that were leaked - with Aurora coverage - did they name it the 'Aurora' because they knew it was going to get leaked to the public - and named it so to cover their real project, the ASTRA? Lot's of questions un-answered and we are probably not going to get an answer for another 50 years. Also, it has a serial number - which actually states that this aircraft is, in fact, in operation...oh..but there is no knowledge of such a registration. Was it in operation in the Balkan theatres because the Air Vehicle series completed all trials successfully, Or was the crash the last time it ever flew and the program scrapped? 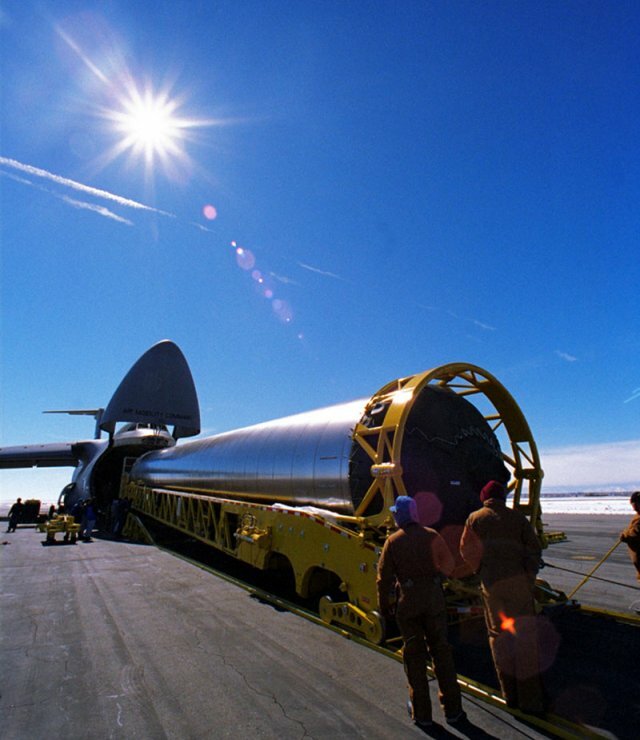 In 1996 the US Government stated, for the first time ever, that it had TWO 'Black Projects' under way at Groom Lake (The base they say does not exist).Was this the reason they 'claimed' Freedom Ridge and White Sides? Was one of these projects the ASTRA? And, on the day it crashed at Boscombe Down, had it flown from Nevada to the UK, hypersonically...or was it just a supersonic aircraft! again no answers. According again to witnesses and various reports, it was definitely in the UK for at least a week, conducting trials at Boscombe Down, and also maybe RAF Machrihanish (as was 'Aurora', supposedly). Anyway, there is a link between the YF-23 and the ASTRA/Aurora. The fact that the YF-23 was extremely fast, and was very fuel efficient, was maybe a reason why they may have used this 'unsuccessful ATF' as a test bed for the ASTRA. 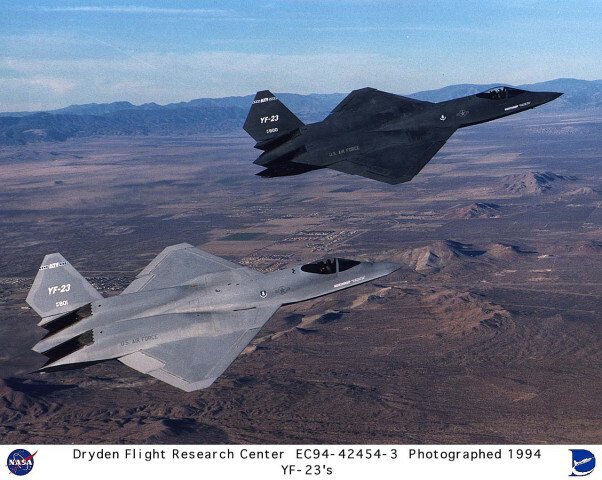 Was the YF-23 intentionally unsuccessful in the ATF Fly-Off because it was so much more a better design and advanced. The fact that it was from Northrop, and that funding become enormous for Northrop - when prototypes were brought to life in 1987 - may be a link too. From artist's impressions, the ASTRA does have a strikingly similar appearance to the YF-23 - except for the canopy, and inward-canted tail-planes. But there's also another link - the F-19 had originally been thought to have inwardly canted fins, and was proposed as - The Aurora! This UK base is situated on the Mull of Kintyre in Scotland, a very remote location. It also has, (coincidentally - along with Boscombe Down), one of the longest 'military' runways in the UK. It has been known that for many years this base has had affiliations with Black Projects, including the Aurora, which could well be the ASTRA or a decoy...or an elephant with wings. Without no photographic proof, it is hard to say what really went on at this base during it's prime. Out of countless 'witnesses' of testing here and no photographs to back it up over the many years, was Machrishanish really used as a secret testing facility? Were the SEALs at RAF Macrihanish when the Black Projects were deployed there - for maximum security - as was the case at Boscombe with the SAS or SBS? Possibly - Yes. But, they were probably there because it offered good training and for security purposes when Nuclear weapons were deployed there and stored and offered great experience to Special Forces in training for assaulting an airfield located on cliffs and near the sea. RAF Macrihanish is very remote, and has been recently closed as an RAF Base, but still operates as a civil airport close to the town of Campbeltown. It seems, under the cover of darkness, to be the ideal place for Black Projects. Aircraft spotters and enthusiasts are few and far between around the area but again, it is now a civil airport with the RAF operating it under Care and Maintenance status and used for exercises only (mainly USAF 352nd SOG training out of RAF Mildenhall and RAF detachments of fighter jets for exercises in Scotland). But, as mentioned above, like Boscombe and like Nevada, we have again, no 100% proof because no photographic evidence has ever surfaced. Campbeltown Airport, as it is now called will never reveal the 'black' days it once had, or did not have because of this lack of evidence we always seem to find when 'chasing' these kinds of programmes. Machrihanish will always be "a has been" and "possibly" or "not sure" airfield to researchers and enthusiasts because of this. DOES THE UK HAVE A PART IN THE ASTRA? Why else would the US, with its very extensive ECM, Bombing & Test Ranges - the largest & possibly best equipped in the world, want to deploy its most secret projects in the UK for testing and maybe operational purposes? British Aerospace Systems has something to do with this, with the fact that BAe has been developing its own Black Project for some years. Lockheed even went as far as designing & almost developing an F-117 'B' variant for the RAF! In the years of the F-117 being secret, and being operationally flown out of Tonopah Test Range (TTR), Lockheed and the DoD/USAF invited a selected few RAF (and BAe?) pilots from Boscombe Down and Warton to train and qualify on the F-117. This was when the aircraft was still very secret, with no one knowing the programme every existed apart from those involved! It just so happens that one of these pilots was from DERA. So why invite UK pilots to qualify on a then-highly secret aircraft made by the US alone. Were they alone in developing the 'Have Blue' project? Why invite another countries test pilot to test fly an aircraft at Area 51? BAe has openly admitted it has workers at Plant 42 - with both Lockheed and Northrop, and mostly on the JSF program - but are there workers from UK working with Northrop on the ASTRA? I think so, and this goes with a lot of projects. Night operations are conducted in many designated areas, all over the UK - but particularly around the South West of England. I see and hear them on scanners all the time - flying overhead. With the many ranges, and the supersonic tracks in the South West Approaches, it is possible for the ASTRA to conduct extensive trials here - in the UK - with full UK participation but with a lack of a 'secret' airfield from prying eyes, well...! We will not know the answers to the questions atleast in the near future, so the mystery of Boscombe Down continues to be that, a mystery, and will do for the foreseable future. The same goes with all Black Projects... we need proof...and that proof comes in the way of official documents and witness photograph's, which coincidently never materialise when someone sees a black project flying in the sky! Apart from my own contributions to the above report, I obtained some information from the excellent article by Ren Hoek and Marco Van der Valk, which appeared in Air Forces Monthly. My other sources remain 'green' and shall stay that way.